Without a doubt, everything leading up HELLBOY’s release has been divisive among fans and critics alike. From the first photo released of David Harbour as the title character, to the Right Hand of Doom more metallic than stone, to reception to the first trailer & every one to follow. …comic books do not always mean “superheroes”. And that’s definitely the case here with HELLBOY, because, for me, HELLBOY was always a horror/action comic. I mean the comics are filled with myths, demons, gore, the supernatural & paranormal. Definitely NOT a superhero comic, and going into this movie thinking it’s a superhero movie definitely does a disservice both to the audience and movie alike. But what about the movie itself? I have to say I really enjoyed this movie. Is it perfect? Not at all. But few movies are. Does it compare to Guillermo del Toro’s movies? Well, that’s a debate for Wednesday nights at your local comic shop. But I definitely think if you’re a fan of the Hellboy comics, you’re definitely going to enjoy this movie. Hellboy is back, and he’s on fire. From the pages of Mike Mignola’s seminal work, this action packed story sees the legendary half-demon superhero (David Harbour, “Stranger Things”) called to the English countryside to battle a trio of rampaging giants. There he discovers The Blood Queen, Nimue (Milla Jovovich, Resident Evil series), a resurrected sorceress thirsting to avenge a past betrayal. Suddenly caught in a clash between the supernatural and the human, Hellboy is now hell-bent on stopping Nimue without triggering the of the world. 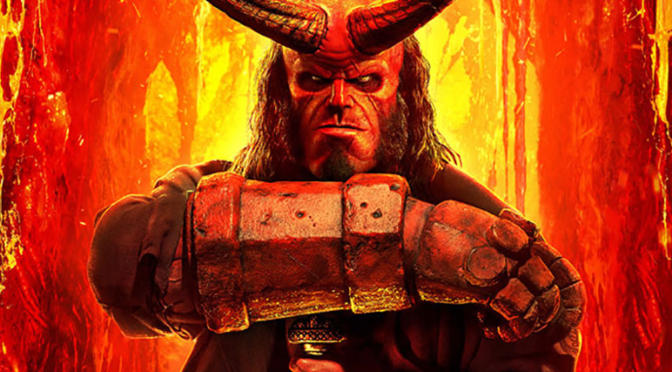 Hellboy also features Ian McShane (John Wick), Daniel Dae Kim (“Hawaii Five-O” and “Lost”) and Sasha Lane (American Honey). Really the only issue I had with the movie was the prologue. Not that there was one, but more it’s execution. It was just a weird bit of tone and dialogue. Without a doubt, a disconnect from the rest of the movie. But the main chunk of the movie, in my opinion, was AWESOME! All the action, humor and fun I’ve come to love from the comics, and the previous movies. And for those who’ve been apprehensive about Harbour’s casting and/or it not being Ron Pearlman, rest easy because David Harbour is great in the role! And it’s funny, I don’t know if it was intentional or not, but I really felt like the spirit of Pearlman’s performance was continued. Which was interesting, because supposedly David Harbour had been in constant contact with Mike Mignola, picking his brain about everything Hellboy. One can only assume trying to get a picture of what brought about the inspiration of the character to add to his performance. And, for me, what felt like having Pearlman’s performance being carried on felt like a nice nod to the past. But let me clarify, it was by no means an impersonation of Pearlman’s Hellboy, Harbour definitely made the character his own, but just feeling like Pearlman influenced his performance in some way was just, nice. OH, and fans the comics, there was a fun little Easter Egg or two for you in the movie. Enjoy! All in all, if you love the comics, the previous movies… if you just love fun movies, don’t listen to the critics, and have a great time at the movies, and go see Hellboy!